No need for wheelbarrows, shovels or other hand tools when you roll onto tight jobsites with the Bobcat® MT85 mini track loader. The MT85 goes through gates, doorways or other narrow spaces with ease. The MT85 offers a performance boost with its improved rated operating capacity, increased breakout force and a 12 percent increase in lift height. The smoother ride leads to less spillage of material during transportation, allowing for faster cleanup at the end of your job. The MT85 increases top travel speeds by 23 percent to help you complete tasks faster. Using the ergonomically-designed ISO joystick controls, it’s easy to maneuver the MT85. The dedicated ride-on platform keeps you above the surface conditions at all times. Equip the MT85 with either the Common Industry Interface (CII) or the exclusive Bob-Tach® mounting system. The Common Industry Interface design allows you to pair the MT85 with many attachments you may already own and use, while the Bob-Tach mounting system delivers rapid attachment changes and superior attachment fitment. 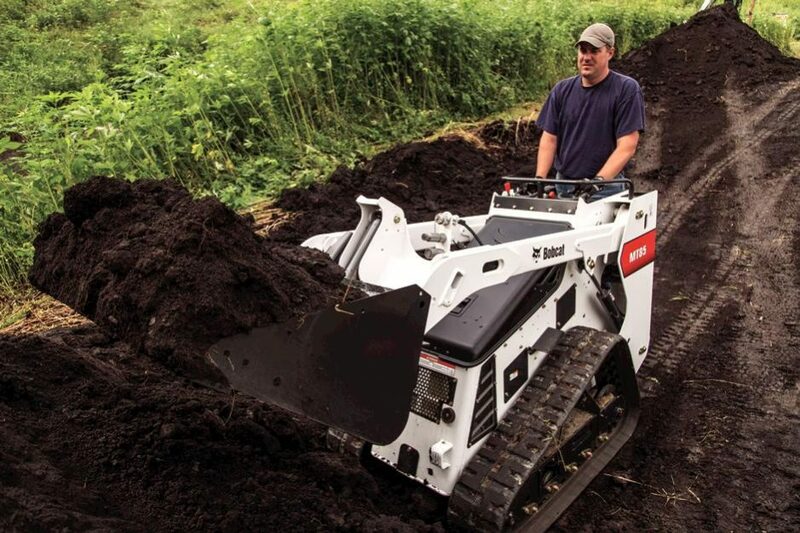 Use your MT85 for trenching, digging, carrying materials, demolition, site preparation, snow removal, utility installation, sweeping, stump grinding and more.